Hi everyone, and welcome to this week’s installation of Tuesday Test Drives. Today, I drove the 2013 Nissan Pathfinder SL. 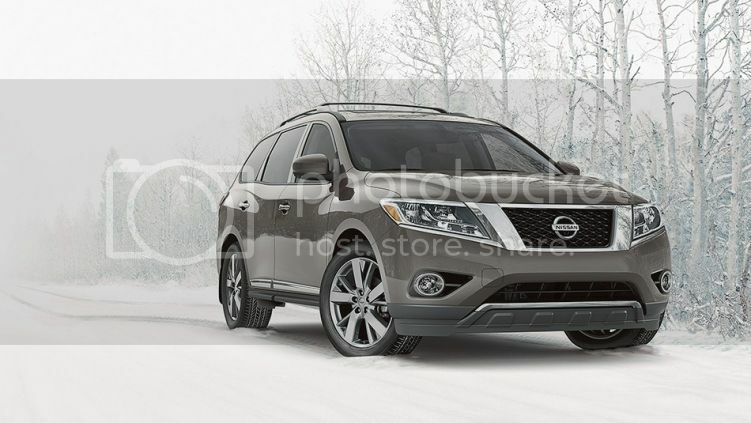 The Pathfinder is completely redesigned for 2013. When the first one arrived on the lot at Peoria Nissan, my friend Charlie (Sales Manager) sent me a message. I had been asking about this vehicle for over 6 months. I’ve driven other generations of Pathfinders and couldn’t wait to see what Nissan had in store for the newest version. I have to warn you – If you’re a Pathy purist, the change is going to be shocking. So much has changed, you’ll wonder why they decided to call it a Pathfinder. Inside and out, it is nothing like the previous models we’ve all grown up with. Let’s get the “bad” out of the way first. The Pathfinder is no longer built on a truck platform. The first thing you’ll notice is the ground clearance, or rather the LACK of ground clearance. The 2012 had a ground clearance of over 8 inches. The 2013 has been lowered to 6.5 inches. Just to put that in perspective, the Versa has a ground clearance of 6.8″, the Juke is 7.0″ and the Pathfinder has only 1″ more clearance than the Prius, at 5.5″. I will not go down the “CVT-rant” road because all of you know how I feel about it, but it is the only transmission available on the 2013 Pathfinder. The VQ35DE V6 is the only engine option – a V8 is no longer available. Towing capacity is 5,000 lbs – and they don’t mean 5,010 either. From the Nissan website, “When towing at or near Maximum Trailer Weight, the allowable vehicle cargo and/or number of passengers is reduced because it is necessary to stay below the Gross Combined Weight Rating and the Gross Axle Weight Rating. If the vehicle has cargo and passengers, the allowable Maximum Trailer Weight is reduced. See your Towing Guide and owner’s manual for proper use.” That’s a 2,000 lb. reduction in towing capacity from last year’s Pathfinder. For some, these changes might be unforgivable. Most Pathfinder owners I know like the Pathfinder because they can go off-road, tow boats and trailers, get to their favorite mountain biking trails or hunting spots, and do all of the fun stuff you do in a 4×4 – and still take their families with them. The previous generations were very capable off-roaders; this generation will not be. The execs at Nissan said they moved in this direction because most people who bought a Pathfinder never took it off road anyway. I happen to know a bunch of people who would disagree with that statement, but I’m sure Nissan and I are talking to two completely different focus groups. 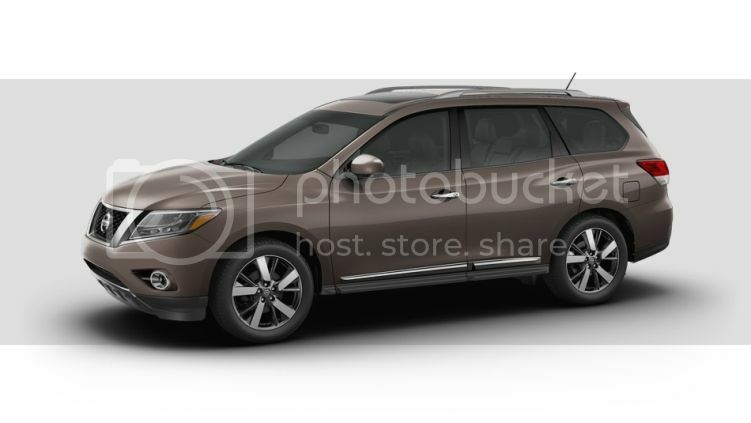 While I agree 100% that they should have built this car, they should not have named it the Pathfinder. If there is no market out there for the Pathfinder, then retire the name, retire the platform, and move on to something different. Here’s why: If someone is shopping 7-passenger wagons, they might look at the Ford Flex, Mazda CX-9, GM’s Traverse/Acadia/Enclave triplets, Mitsubishi Outlander, Subaru Tribeca, Honda Pilot, Toyota Highlander, Kia Sorento and the Hyundai Veracruz. However, they might not even consider the Pathfinder, simply because “Pathfinder” has a reputation for being an affordable, capable off-roader on a truck chassis. Never mind the fact that the Pathfinder may, in most categories, outshine the competition – It simply might not even get considered, based on its previous reputation. As an example, the Traverse replaced the outgoing Trailblazer. No confusion there. Having said all that, there is a lot about the Pathfinder that I do like and I think you will too. Let’s talk about the ride. I’ve had people tell me that there is no use for me to ever write about ride quality. Their argument: our roads in Arizona are in such good condition that I would never know if I was getting any feedback from the suspension. I made it my personal mission to find something in the road I could hit (please don’t tell the guys at Peoria Nissan I said that). I needn’t have bothered. I had almost zero bad feedback. The Pathfinder rides smooth as silk, especially on the freeway. The one good thing about that low ground clearance is that you don’t get that “floaty” feeling that sometimes happens with large cars. There are no problematic blind spots, no wind noise from the side mirrors or the wipers, and no tire noise. Those three things happen to be huge pet peeves of mine and I am glad they are a non-issue in this model. This is a huge, and welcome, departure from prior Pathfinder models. 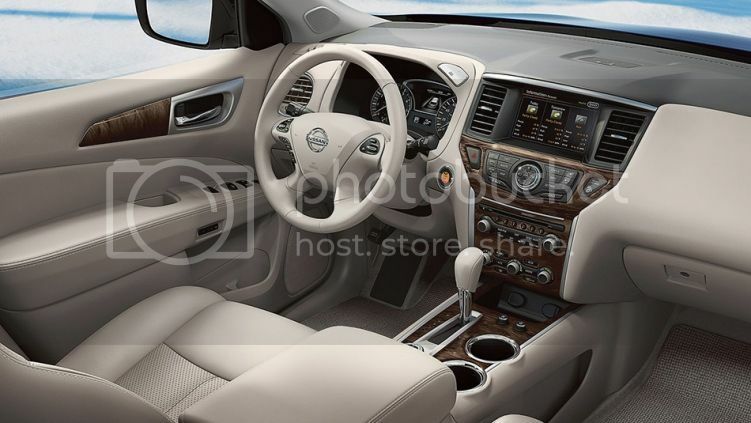 There are only two interior colors available on the 2013 Pathfinder. The interior color of the SL I drove was a light tan leather that Nissan calls “almond” and it was very beautiful. I like light-colored interiors, but if you have a family of rugrats to haul around, you might want to consider the “charcoal”. Be advised, it’s such a dark color, Nissan might as well have called it black. While it will show dirt after a while, it won’t look dirty as quickly as the “almond”. Personally, I think they should have offered a third shade somewhere in the middle of those two. The center stack is very well designed. It has everything you need without being too fancy, which I like. The interior is not boring but it’s not too busy-looking either. While the SL is remarkably well-equipped, there are three trim levels above and beyond the SL (SL Premium, Platinum, and Platinum Premium) that I drove, so there are plenty of goodies for those of you who are uber-tech savvy and feel there are more bells and whistles that you absolutely must have. Even in the SL trim level, Nissan has a knack for setting up the driver pretty well when it comes to placement and ease of controls. I loved the layout. It reminded me a lot of the interior design of the high-end Murano we evaluated previously. 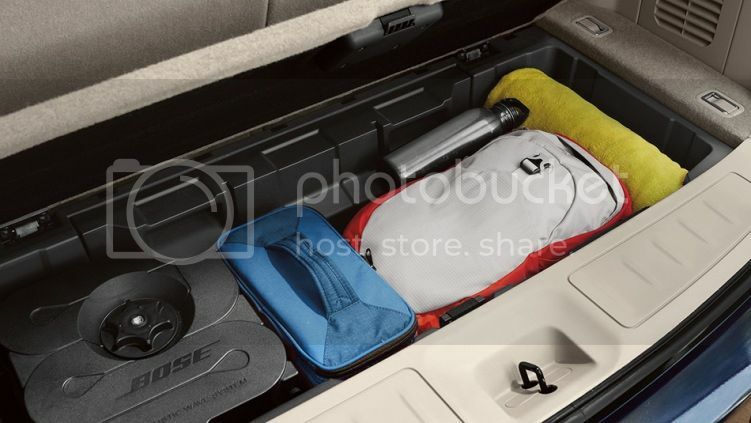 Cargo space is sufficient for 4 or 5 people to take a long weekend trip (at 16 cubic feet). I’m thinking that squeezing two more bags back there for two more people might be a stretch. There is a storage bin built into the floor behind the third row that is very convenient – but not very big. 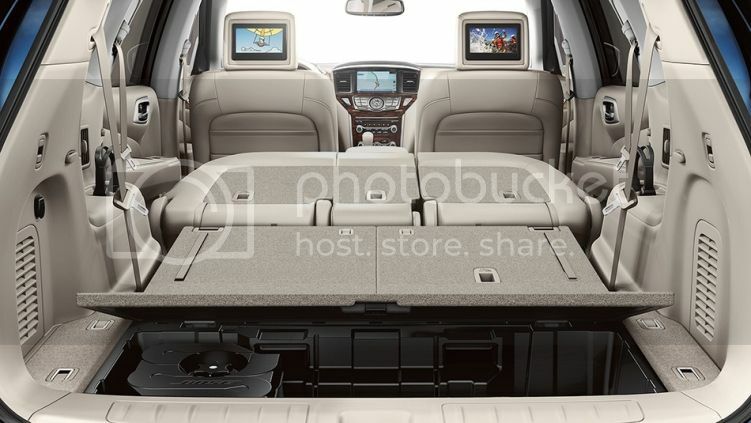 Folding down the 3rd-row seats increases the cargo space to a cavernous 42 cubic feet. Folding the second row flat? 79 cubic feet. You could move a small apartment with the Pathfinder, not that we’re looking forward to hauling our own kids off to college or anything… The SL version that I drove offered a power lift gate which is a fantastic option. When you’ve got your hands so full that there’s no way you can possibly grab the handle and not drop everything you’re carrying, you’ll thank Nissan for including it. The pricier models do offer an Around View Monitor that will help you park if necessary. It will come in very handy for some, including those who have medical issues and whose range of motion is limited. I can honestly say that I have no idea about the quality of the audio system. I was too busy being fascinated by the fact that I couldn’t hear wind noise from the side mirrors – well done, Nissan. 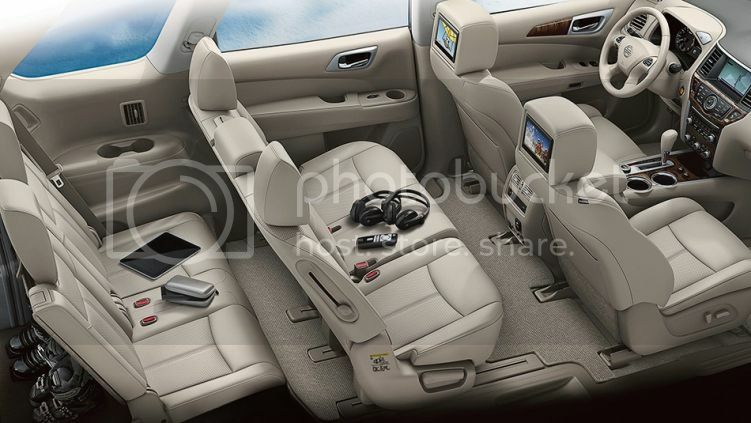 The Pathfinder boasts seating for 7. While there are 7 seats with seatbelts, there is no way I’d stick two adults in the third row for a long trip. It would be sufficient for younger kids, but kids tend to get sick when they sit in the very back, so that just might be counterproductive. I am 5’7″ and I can get in and out of that third row with no problem; however, I don’t think I’d like to sit back there for a long distance unless I was alone and could stretch my legs out on the entire back seat. My partner-in-crime for this test drive was Peoria Nissan’s Kevin Schwartz and he is 6’5″. He politely declined to climb into the back row but assured me that he has done it before and he does NOT fit comfortably. Second-row seating is phenomenal for two out of three people. The person sitting in the middle seat might be a bit squashed depending on the girth of the other two occupants. The seat pan is smaller than the two outboard seats, but it isn’t a dealbreaker. The back of the center seat folds down into an armrest / console if you just have two passengers in the back. Everyone gets their own vent so you can control how much heat and A/C is blasted in your face. The seats are amazingly comfortable, probably my favorite feature on the entire vehicle. They are a considerable upgrade from the previous generation; once again, very much on par with the seats in the Murano and the New Altima. The exterior colors available are your usual suspects (with a couple of notable exceptions): Nissan offers the Pathfinder in Red, Dark Blue, Super Black, Dark Slate, Moonlight White, and Brilliant Silver. However, the outstanding colors are the Desert Sand and the Mocha Stone. My personal favorite is the Dark Slate, followed by the Mocha Stone. Very beautiful shades that really accent the Pathfinder’s fluid, sculpted design. Time to climb back on my soapbox once again: As much as I hate the idea of a CVT, I have to give the devil his due: it works here. In normal driving conditions, the Pathfinder is effortless to drive. There is a slight hesitation when building up speed such as on a freeway on-ramp, but it is nowhere near the panic-inducing sluggishness that is present in the CVT pairings with the 1.8L and the 1.6L cars. It would make a fantastic road trip vehicle and the mileage improvements over the previous generation’s 4.0L can’t be denied. EPA mileage estimates for the 2012 Pathfinder were 15/22. In the 2013 Pathfinder, those numbers climb to 20/26, thanks to increased aerodynamics, lower-friction drivetrain interfaces, and lighter construction materials. The 4×4 version of the Pathfinder gets a rating of 19/25 which is very impressive. However, I would not be comfortable towing anything with this. The equation “CVT= good tow vehicle” just doesn’t compute. The fact that Nissan is so specific about the towing capacity makes me wonder how spectacular the catastrophic failure would be if you fudged the weight a bit (as most everyone does). There is a commercial that shows a Pathfinder pulling an Airstream trailer – but looking up the weights of some of those trailers makes me wonder if that would be a realistic possibility. Well, what improvements could Nissan have made? Not many. Here’s one possibility – I think they should offer a special edition for those who are very much into what the Pathfinder used to be. Offer it up with a higher stance, beefier tires, an upgraded drivetrain (VK56DE, perhaps?) and the same towing capability of the previous generations. Regardless, there are lots of other people who are in the market for something very much like the 2013 Pathy, but not ANYTHING lke the ’12. Truthfully, I believe the only mistake Nissan made with the 2013 Pathfinder might be this: Applying a Pathfinder badge to a vehicle that in no way resembles the Pathfinders of old. I strongly believe that if this vehicle had been introduced as “The All-New Nissan Bordeaux,” or something else awesome, the automotive press and consumers would be falling all over themselves with praise. Sadly, as I said before, it might not even register as an option for its target market – and that’s disappointing, because it’s a fantastic vehicle. If you or your wife needs an awesome grocery getter / kid hauler and you don’t want a minivan, this just might be what you need. Nissan absolutely nailed this one and it is my favorite of the new lineup so far. If we didn’t already have 14 cars in the garage, I would have written a check and driven it home – Dark Slate, with Almond interior, please. I’d buy it, debadge it, and tell people, “it’s a 2013 Bordeaux” – it’s just that good. Congratulations, Nissan. You knocked this one out of the park. Join us for a discussion of the 2013 Nissan Pathfinder, and have your questions answered by Nissan’s Product Planner for the Pathfinder, Evan Fulton, here!